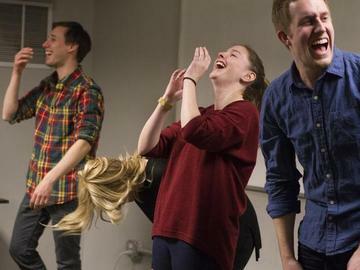 This six week class will give you a basic, usable understanding of how to begin crafting a stand-up comedy act, from absolute beginner advice on stage presence to different approaches to generating material. Students will learn how to take their thoughts, experiences, and observations about life and blend them with their own unique sense of humor and personality to begin crafting their own routine. Includes class performance a the end of the course. Read through our terms and conditions of enrollment prior to enrolling for informatoin on refunds, attendance policies, and more. You will be asked if you read through everything at checkout. Rachel Fogletto is a stand-up comedian from Philadelphia who is known for her unapologetic humor and dry charm. Rachel co-produced the Bechdel Test Fest in Philadelphia in 2016 and 2017 and has performed in the Boston Comedy Arts Festival in 2013, The Women in Comedy Festival in 2014, and the SheDot Comedy Festival, and Whiskey Bear Comedy Festival in 2016. Rachel has performed in showcases as well as opened at both Helium Comedy Club and Punchline Philly. You can pretty much trace her every move at RachelFogletto.com or track her current emotional state on Twitter @RachelFogletto.